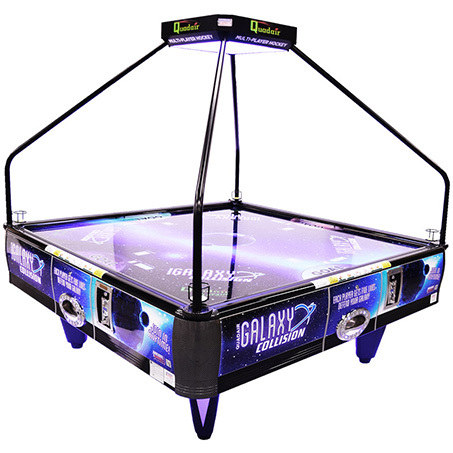 ​The Dynamo Arctic Wind Air Hockey Table is a classic, no-frills air hockey table which brings you all the features you'd expect without putting a freeze on style. It sits perfectly still while you slapshot your opponent silly, resting on solid legs with supports and a heavy-duty cabinet. Underneath the smooth playfield hides a powerful, yet quiet, blower motor that creates a smooth cushion of air from corner to corner. It also features aluminum rails, quick, no-clog puck return, and class scoring slides. You'll never chill out quite the same way again. The Dynamo Arctic Wind's rugged construction and professional-caliber styling is a winning addition to any game or family room.